Some of us in the cast perform regularly with the Vancouver TheatreSports League, an improv company that has been around for over 30 years. They’re opening a new show very soon (Preview week starts April 19, and the opening is April 26). It’s a parody of TV shows like “Dragon’s Den,” so I’ll forgive the “D” word in the title of a second comedy show in this town. For now. By the way, anyone look familiar on that poster? A certain Dwarf Fighter, perhaps? 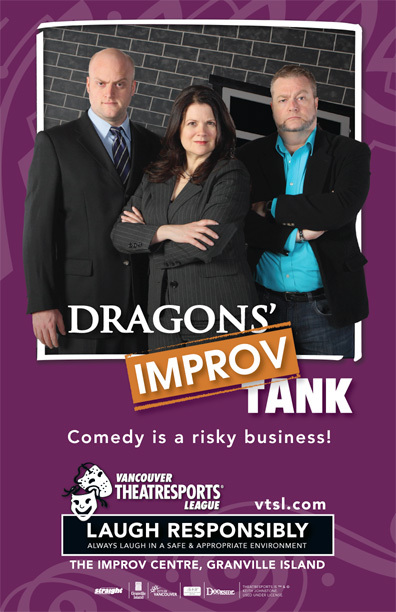 Depending on the night, you could catch Eric Fell, Allen Morrison, or eyebrow-raising poster boy Shaun Stewart performing in “Dragons’ Improv Tank” on Thursdays, Fridays, and Saturdays. Check the VTSL cast page to find out when we’re playing. There’s also the classic TheatreSports matches, late night Scared Scriptless shows, and a weekly musical in case you need us more than the last Wednesday of every month.